David Oxtaby is a Photographer from the Ilkley Area who not only produces wonderful Bench photographs but has over 1200 followers on his very popular Flickr page ( flickr.com/photos/doxtaby ). David has very kindly given ‘My Favourite Bench’ permission to share with you his Bench photos from around the Yorkshire Moors and Dales. David has also produced a lovely calendar for 2020 that can be ordered through his Twitter or Flickr Page. If you want to purchase any of David’s photographs, they can also be purchased on the same pages. Fryup Dale is separated into two small villages or dales, Great Fryup Dale and Little Fryup Dale. The majority of people live in Great Fryup dale with Little Fryup having only a few farms and cottages. Neither village has a shop or a pub. Whenever I venture up onto Ilkley Moor I get that sudden surge to sing a certain song at the top of my voice and of course there’s only one song you can sing. Yes of course it has to be that Great Yorkshire National Anthem…..
Another Bench that David has pictured beautifully is this one at the ‘Cow & Calf’ also up on Ilkley Moor. The views from this Bench down over Ilkley are well worth the walk. There’s not many places in the world that I visit that has as many Benches as wonderful Whitby. It might get a run for its money from Edinburgh but I still think Whitby would win. Whitby is a seaside resort in North Yorkshire which is split in two by the River Esk running through it. On one side of the river and up 199 steps you will find the ruins of Whitby Abbey. The abbey was Bram Stoker’s inspiration for ‘Dracula’. On the other side of the River stands a grand statue of British explorer and sea farer Captain Cook. who sailed on expeditions to Austrailia, New Zealand and the South Pacific aboard his ships HMS Endeavour and HMS Resolution. David has nicely captures the cloud inversion over the Wharfe valley, This Bench is located at Surprise view at Otley Chevin. 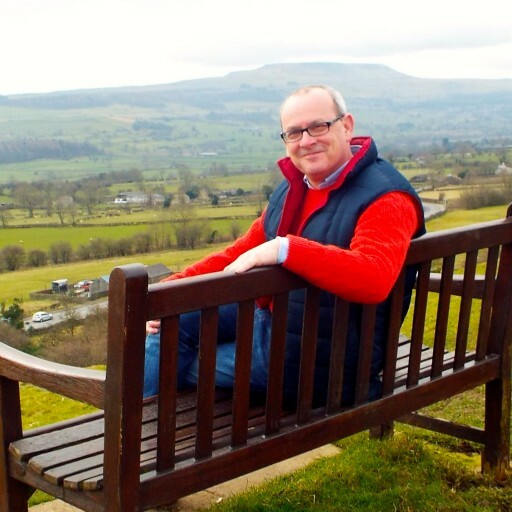 I love all of David’s photographs but my Favourite must be the Bench at Oakworth station on the Keithley and Worth Valley Railway. Although it’s a lovely, idyllic photo I love it because it reminds me of my childhood and my favourite film ‘The Railway Children’. The Railway Children is a children’s book by Edith Nesbit, originally serialised in The London Magazine during 1905 and first published in book form in 1906. It has been adapted for the screen several times, of which the 1970 film version is my favourite and best known. The mothers was played by Dinah Sheridan and the children were Roberta or Bobbi played by Jenny Agutter, Phyllis played by Sally Thomsett and Peter played by Gary Robbin. my favourite of all the cast was of course Mr Perks played by the wonderful Bernard Cribbins, Oakworth is where the bumbling but lovable Mr Perks was the Station Master. If you’ve been living on Mars and have never watched this wonderful film, I’m sure you will be able to pick up a copy on Amazon or E bay for pennies. This view looks down the valley towards Pately Bridge. David catches the sun beautifully as it peeks through the trees. I would like to thank David for helping me promote My Favourite Bench through his images and If you have also enjoyed David’s photographs or my Blog I would love it if you would leave a comment of support at the bottom of the page.